Darkness Brutal totally caught me by surprise. I had been reading books found in Kindle Unlimited--you can borrow one a month if you are a Prime member--and was sorely disappointed that all the books I want to read weren't available to borrow. But Darkness Brutal popped-up as a recommendation for me based-off of my ratings. Having just come out, there were few reviews to guide me. And I don't usually read Indie books (although here is another I recently read, Gift of Poison). Even so, I thought I would give it a chance. I shouldn’t have been concerned. Darkness Brutal was great. Really great. Definitely in my top ten YA this year! I knew Andye was going to post an Indie Spotlight on Darkness Brutal, but I swore I would write a review too, even if later, because it was just that good and I wanted to make sure all of you know it! 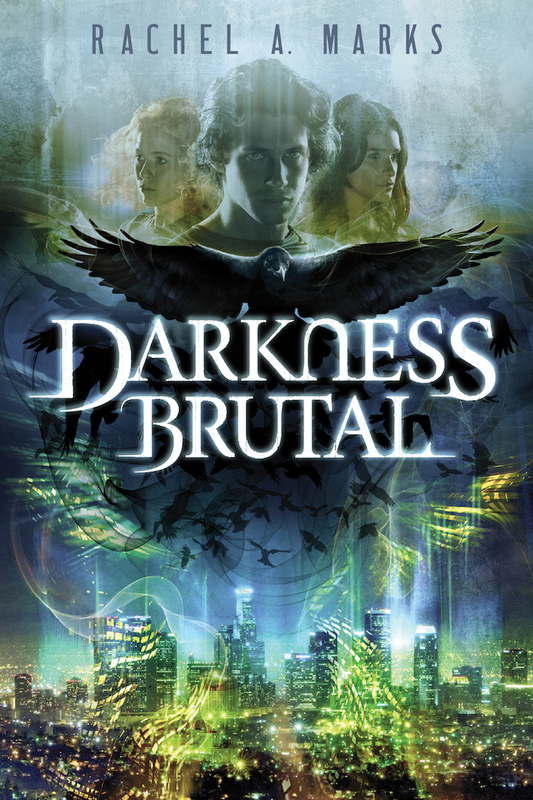 Darkness Brutal was like any classic Demon hunter book, very Cassandra Clare’s Mortal Instruments and it was just as engaging as any of her series. The story starts rolling with action right away, a homeless teen dispatching a demon and discovering that he had a few more skills up his sleeves than he knew of. We like the guy too, as imperfect as Aiden is. He is trying to keep his sister alive while dealing with crazy flashbacks of his past, like gory demon-led murderer and all the confusion in the world surrounding his witchy mother and father, vacated. Right away Aiden is introduced to a new crew. They are paranormal, but not in vampire and werewolf style, but more like superhero sensing. It made me think of a combo-pack of The Hourglass, Paranormalcy with a tad bit of Miss. Perigrine’s. I loved that together these kids hosted a TV show on paranormal activity, which seemed like a good income if you are so-gifted. There were some great characters in this book. The other people on the team just brought in the humor and pulled out the depths of the main characters. But, Sid. I really didn’t like Sid, the creepy guy who lead the kids. He seemed to dabble in pretty nasty stuff and we all knew he was hiding something. Then there was Kara, the tension was always so high with her and we knew she was hiding secrets under her tats with her disturbing gift and disturbing task. I wasn’t sure if I should dislike her, love her, or just feel pity, despite her tough exterior. But by the end of the book I ended up loving Kara. I originally was rooting for the other girl so in need of saving. I can’t always handle love triangles, and author Rachel Marks weaved this one in a way I’m still not sure I can tolerate, with too many hanging threads, despite how close one of these couples became. This novel was anything but boring. Through the whole story there was action, whether it was with people, love, family, or demons. I didn’t feel like it was shallow either, it ran deep in a way where it really was evil vs. good, rather than just on the surface and it provoked. Then there was the mystery; it took a few turns I was in no way expecting. It wasn’t easy to piece everything together--I just read this a couple months ago and already want to re-read it, just to figure it out more and remind myself it wasn’t just in my imagination that I loved Darkness Brutal so much. I am so excited this is a series and can’t wait for the next one! Of course, after I was so impressed with this novel, I looked up the author, Rachel A. Marks, and discovered she is also a talented book-cover design artist and just all around looks like a cool person. I was bummed I didn’t go to the San Diego Comic-Con the week before to meet her. But at least I have Marks’ book and I am convinced you should too (something I rarely ever say), if you like paranormal even just a little bit. I am afraid of saying more, lest I spoil anything. I want you to love it!